WHAT'S ON THE PURITAN HARD DRIVE? God's Law, The Ten Commandments, etc. Reformed Presbytery, RPNA Protesters, etc. Reformed Worship, The Regulative Principle, etc. Roman Catholicism, the Jesuits, Islam, etc. Are You Looking For A Covenanter Church Or Are You Interested In Covenanter Worship (Along The Lines Of The Original Intent Of The Westminster Standards)? If So, Please Email Pastor Greg Price At covpastor@gmail.com For More Information About How To Take Part In A Covenanter Service, From Your Location, Via Conference Call. Over 600 Free MP3 Sermons By Greg Price Are Also At http://ow.ly/NTvq30m3wuu. FREE Reformation and Puritan Email Newsletters. Sign Up Now! To obtain free Reformation books, Puritan MP3s and Calvinistic videos, SWRB discount coupons, etc., add yourself to SWRB's Puritan and Reformed email list by using the form above. "Behind every great movement of God stands a few generous men and women called Gospel Patrons. Their role of resourcing, partnering, and strategizing with those who proclaim the gospel fueled amazing works of God. This book tells three stories from history that invite us to believe God, step out, and serve the purposes of God in our generation too." - Gospel Patrons: People Whose Generosity Changed the World https://www.gospelpatrons.org/ -- You can get a free PDF and audio (MP3) version of this stirring book at https://www.gospelpatrons.org/. 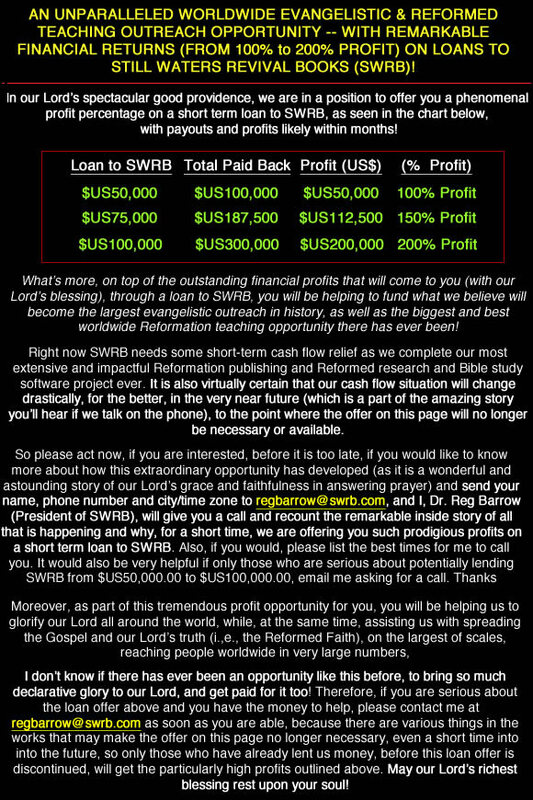 Just sign up to their email list (at the bottom of of the page at https://www.gospelpatrons.org/), and confirm the email they send to you, to confirm your email subscription, and they will email you the links to the free versions of the book, Gospel Patrons: People Whose Generosity Changed the World, when they respond to your email list confirmation email. This book demonstrates the indisputable importance of the people God calls to help fund the ministries that He has chosen to play large rolls in some of the biggest Reformations and revivals in history. It uses the examples of William Tyndale, George Whitefield and John Newton. As with all links we provide we only agree with that which is in agreement with the Bible at the sites where the URLs point. Most shipping from our USA facilities. Copyright 2019 Still Waters Revival Books. 4710-37 A Ave NW Edmonton, Alberta, Canada T6L 3T5. Phone: (780) 450-3730.